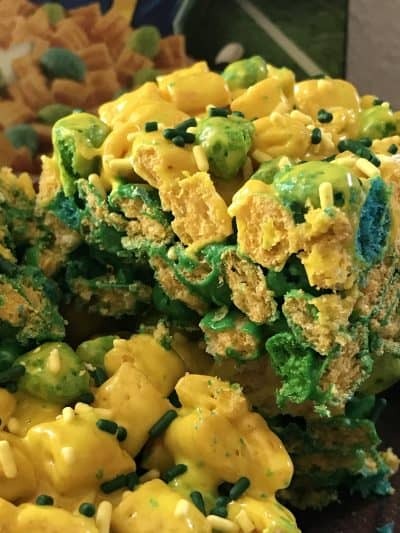 Today we’ll be sharing a recipe for Captain Crunch Marshmallow Treats. This recipe is a new twist on that old classic; Rice Krispie Marshmallow Treats. 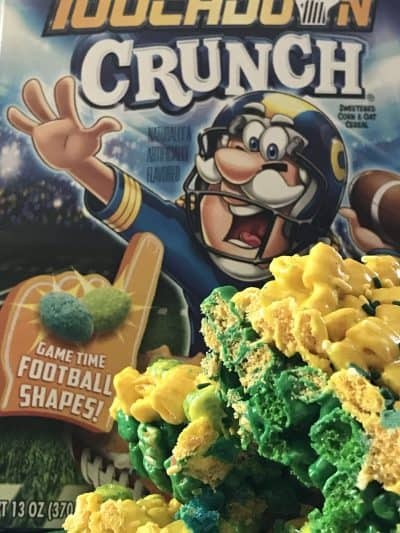 Captain Crunch Touchdown Cereal is a ‘Limited Edition’ cereal, that I imagine is only available during the football season:) Captain Crunch Touchdown cereal is basically the same as regular Captain Crunch, except the ‘touchdown’ version has green shaped footballs scattered throughout. I’m embarrassed to say this but this is the first time I’ve ever eaten Captain Crunch Cereal. I’m no spring chicken, which means that’s a long time to go without trying Captain Crunch Cereal. I have never been a big cereal fan, hence the reason why. I only eating cereal in marshmallow treats, and then later on in life, eating the dreaded bran flakes, which I actually love..now. I’m also a huge fan of granola and oatmeal. When I was younger, I never ate breakfast. I would grab a banana and head out the door. Now I enjoy breakfast. I usually have a bowl of cereal or oatmeal, (overnight oats or baked oatmeal, sometimes called Amish Baked Oatmeal are favorites) fruit, such as a banana, bowl of berries or applesauce and a small carton of yogurt. This might seem like a lot to eat for breakfast, but I eat a light lunch and by 5 o’clock, I’m hungry for dinner. Eating on a schedule helps me keep my evening snacking under control. For many years I would skip dinner so I could snack at night. Why I thought this was a good idea, I’ll never know…maybe this was my way of justifying eating junk food or just a way to make up an excuse to snack. No matter the reason or excuse behind my madness, one thing is for sure, it’s a great way to put on weight! I was a huge evening snacker. I like to snack on potato chips, popcorn, candy, and ice cream (not all at once I might add) but I have recently, changed my ways. Now when and if I do snack at night, I try to limit what and how much I snack on, keeping healthier snacks in the house helps, as well as eating a good well balanced dinner. It’s perfectly ok to snack if it’s done smartly. 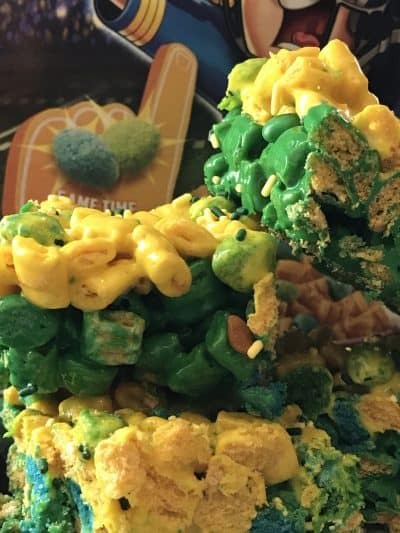 This recipe is just like it’s sister recipe, Rice Krispie Marshmallow Treats, with the only exception, it’s made with Captain Crunch Cereal. 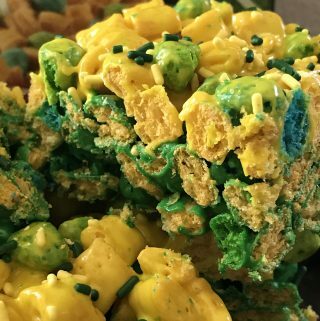 To add color to the marshmallow mixture, I used gel food coloring, in my favorite football team colors, Green and Gold for the Green bay Packers. 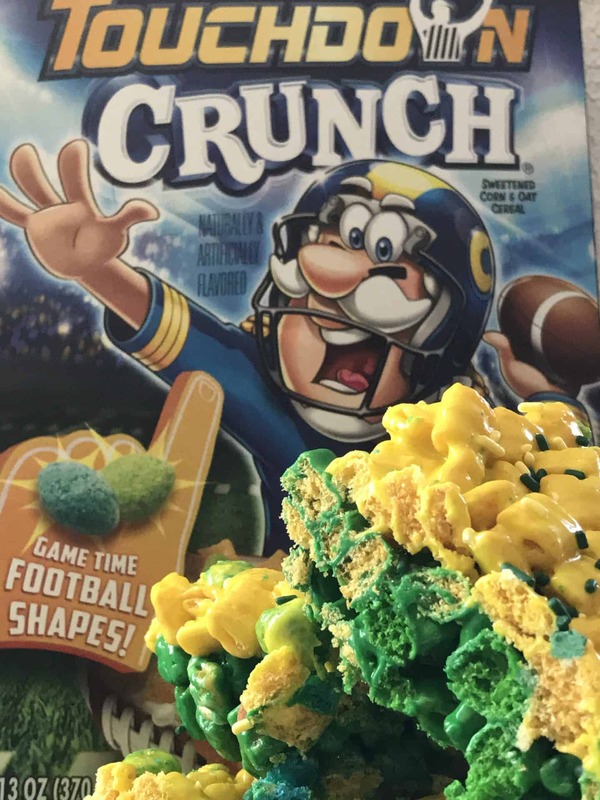 Captain Crunch Touchdown Marshmallow treats are fast, easy, affordable and delicious. 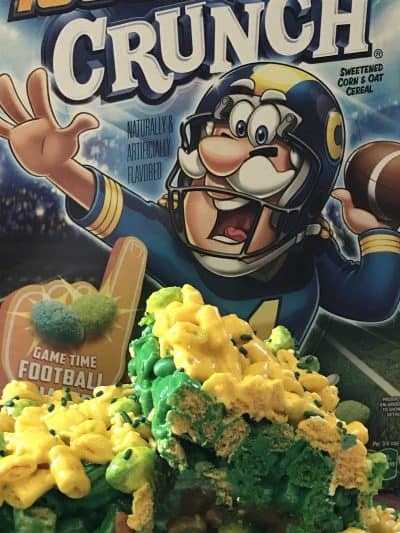 You are sure to score a Touchdown when you serve these delicious treats. Lightly grease a 13 x 9-inch baking dish with 2 tablespoons butter. Set aside. In a large saucepan, melt 2 tablespoons butter over medium-low heat. Add 1/2 a bag of large marshmallows (8 oz) and stir until marshmallows are melted. Stir in a few drops of the first color of gel food coloring. Remove marshmallow mixture from heat and stir in 4 cups of cereal. Mix until cereal is completely coated. Press into prepared baking dish. Set aside. In a second large saucepan, melt the remaining butter over medium-low heat. Add remaining large marshmallows (8 oz) and stir until marshmallows are melted. Stir in a few drops of the second color of gel food coloring. Remove marshmallow mixture from heat and stir in 4 cups of cereal. Mix until cereal is completely coated. Press mixture on top of first color in baking dish. Sprinkle football w/jimmies mix over top of marshmallow treats. Press down lightly. Cool completely. Cut into squares.